The MBS-430-Y Maxa Beam Searchlight is a lightweight, high-intensity illumination system with an output of 12,000,000 Peak Beam CandlePower. The Maxa Beam has three light intensity settings and a powerful strobe that makes it a disorienting non-lethal weapon. The searchlight also features a motorized beam width adjustment that allows the user to vary the beam from a 1° spot to a 40° flood using a wired remote control. MBS-430-Y Series Maxa Beam Searchlights are designed to be mounted and remotely controlled using a wired remote handle or switch set (sold separately). 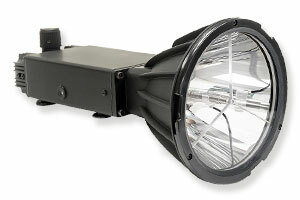 All functions of the searchlight including beam width and strobe can be controlled using the wired remote.